From freshmen to varsity. Must be nice. Well, nice for some of this year’s sophomores – seven to be exact – who are moving from freshmen level football last year right into varsity to fill 24 empty roster spots. Those 24 spots used to belong to last year’s seniors. That’s right, only 40 percent of Penn Manor’s football team is returning from last year’s record-breaking season. While coach Todd Mealy has some inexperience to worry about, he also has something to look forward to. “This sophomore class may be the most successful class around,” Mealy pointed out. One guy in particular in that sophomore class is 5’10” – 160 lb. Adam Sahd, brother of former player Austin Sahd who graduated last year. The younger Sahd will be replacing P.J. Rehm, a three-year varsity starter who also graduated a year ago. Sahd has experienced the Friday night lights before, when a helmet-to-helmet hit detoured Rehm to an unfamiliar place – the sidelines. Sahd led the team to a 36-35 victory that day against Cedar Crest which gave the Penn Manor team home-field advantage for their first district playoff game. There’s surely going to be some tension and some nerves in the air while Sahd and the team’s seven other sophomores take the varsity stage on Friday night at Solanco. Mealy recalled an inspiring instance that relates to Penn Manor’s challenges this year. It’s the story about starting running back in 2007, Carl Christmas. It was Christmas’ first game starting at varsity and on that night it was obvious that he had his own butterflies fluttering around in his stomach. He fumbled not once or twice, not three, but four times in that game. Christmas took that bad game and strove to get better and better as the season went on and prove to the head coach that he was worth the starting position. He went above and beyond – literally. He ran all the way to the top spot in rushing for section one that year. Mealy uses stories like Christmas’ to keep an optimistic approach to the season. There will be a couple fumbles, maybe some interceptions and dropped passes, but maybe there’s another Christmas coming around other than the 25th of December this year. It’s possible that he’ll be one of the seven sophomores making the leap to the varsity level this upcoming season. Penn Manor’s first test is against Solanco at their home field this Friday night. While they are no pushover, Mealy didn’t have them on his list of teams Penn Manor may have to worry about. Wilson and Manheim Township were on his list, along with his sleeper team, McCaskey. Mealy, a former coach in the city school district, said that McCaskey will be the “best group of athletes” they will face this season. Coming off their second straight school record-breaking season of 10-3 (previous school record was 9-3 in ’08) and a visit to the first round of states, Mealy is expecting his young guys to step up and his varsity veterans to stay consistent. Amateurs and veterans alike will be showing off their stuff this 2010 season which could go either way considering all the seniors who departed for college. 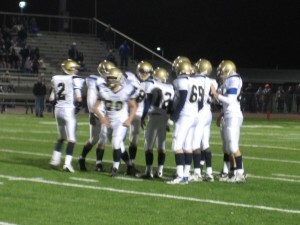 To check out Penn Manor football, go to their recently created website, http://www.pennmanorcometsfootball.com/index.php. From roster to schedule to apparel, you can find it all there. What a great article! This is my favorite sport season of the year and I look forward to seeing the Comets take the field. Alex, Your article is both extremely well written and very informative. Bravo! And Comets–here’s wishing you a successful season!